I am researching the family of my 6th great-grandfather Nathaniel Brown, who was in Framingham in 1761, and spent the remainder of his life in Sudbury, Massachusetts. This is the first half of the search. The next time I post about this, I expect to have formed an answer. What follows is how the search has gone so far. The first thing that I did was to visit the Goodenow Library special collections room in Sudbury, Massachusetts with genea-blogger Midge Frazel of “Granite in My Blood.” Midge’s husband and I are 5th (?) cousins in the Parmenter line; by coincidence, the Parmenter brothers we are descended from, Elias and Ezra, married girls with the same last name, Eunice and Susannah Brown. So we share this search. Midge had located the correct names for Susannah’s parents: Nathaniel Brown and Elinor Hayden. There was pretty good evidence for the marriage and Elinor’s family tree. We consulted some books while we were there, including Descendants of Deacon John Parmenter, Proprietor of Sudbury, Massachusetts 1639, published by Pioneering Parmenters of America, 2009. The question was, who exactly was Nathaniel Brown. Brown was a common name in southern New England, so pinning down this Nathaniel Brown was not going to be easy. Midge found a candidate in Nathaniel Brown of Newton, Massachusetts, son of Thomas Brown and Abigail Cheney. The obvious things one would try first in the search for evidence – census records, vital records, town histories, cemetery records, newspapers and deeds – were raising more questions than answers. As I waited around for the time to explore some probate and court records, I took stock of the situation. I also have some probate microfilm on order. Nathaniel and Brown and Elinor Hayden were married 29 Dec 1761. Nathaniel Brown of Framingham and Elanor Hayden of Sudbury were married December 29th … 1761.- pr Israel Loring. From Massachusetts Town and Vital Records, 1620-1988, Wayland births, marriages and deaths, p204, on Ancestry.com. Snip by Midge Frazel. This is a striking case of a mother naming the children after her parents and siblings. Another solid piece of evidence is the sale of property in Sudbury from the estate of Elinor’s father, Uriah Hayden, to Nathaniel Brown in 1770. This included 60 acres, a house and barn and seemed to be the farm of Uriah Hayden prior to his death. The deed was recorded in 1784 in Sudbury, volume 88, pages 141 and 142. I was startled to see the name “Jonas Brown” in the deed but then recalled it was not recorded until 1784, when Nathaniel’s son was 19. Nathaniel paid Uriah’s sons Ephraim and Uriah, and the widow Hannah a price of 100 pounds. All the men are recorded as husbandmen (farmers). This makes it appear that Nathaniel took over the Hayden farm fairly early in his marriage to Elinor. That sounds like something a person would do if they were a younger son, or didn’t have a father as they reached adulthood. Who was Thaddeus named for? and how about Joel and Nancy? Could there be deeds telling more about Nathaniel’s activities in Framingham and Sudbury? Based on a marriage date of 1761, could Nathaniel possibly have participated as a soldier in the Revolutionary War? Could there be a guardianship record for Nathaniel as a child? Death record or probate for Nathaniel? I wondered if the Newton, Massachusetts family would include a Thaddeus. These are the possible parents of Nathaniel Brown: Thomas and Abigail (Cheney) Brown. They were both born and married in Cambridge, Massachusetts, and in 1737 Thomas purchased property in Newton from his father, Ebenezer, and the family relocated there. The children of Thomas and Abigail were: Aaron, Joseph, Thomas, Ebenezer, Abigail, Mary, Susannah, and Nathaniel (youngest). While a few of the names overlap with Nathaniel and Elinor’s children, there is not a Thaddeus, Joel or Nancy to be found. So far, I am not coming up with enough evidence that the Nathaniel born to Thomas and Abigail in 1761 was indeed the Nathaniel who married Elinor Hayden. But the family includes enough matching names, and shows Nathaniel as a youngest son who might not have inherited from his father. So they are still in the running. 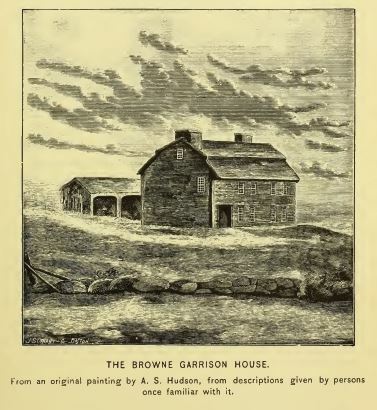 The Brown Garrison House, pictured in Hudson’s History of Sudbury Massachusetts, 1889, p. 199. So far, I have found no link from the early Sudbury Brownes to Nathaniel Brown. I tried searching for Revolutionary War records, first for Nathaniel Brown and then for a (hypothetical) Thaddeus Brown. “Nathaniel Brown” appears numerous times in the Massachusetts Soldiers and Sailors books (vol. 2, p. 668) and the entry dated in Sudbury is likely to be him, at least. But Fold3.com does not show any records that seem likely to be Nathaniel. Similar searches for Thaddeus Brown show a resident of the town of Harvard in Worcester County, Massachusetts who served in the Revolutionary War and later obtained a pension. A Thaddeus Brown was born in Cambridge in 1746, son of William, and there were other Thaddeus Browns in eastern Massachusetts as well. Nothing seems to link to a brother Nathaniel, or a Thaddeus Brown old enough to be Nathaniel’s father. There is a Middlesex County probate record for Nathaniel Brown of Sudbury in 1798, Case Number 3151. I have not seen this yet (I have ordered the microfilm from the FamilySearch Center), and for some reason I have not found his death in the Sudbury records. I cannot find a death record or date for Elinor, either. Her last child was born in 1786. Early Massachusetts land records are available (although lacking an electronic index) at FamilySearch.org. Framingham, Sudbury and Newton are all in Middlesex County so I focused my research there. Other than the purchase of the Hayden property in 1770, the records I am finding do not seem certainly linked to this Nathaniel Brown. Surely, there must be one for the sale after his death in 1798. Look for land records from anywhere in Massachusetts that mention Nathaniel Brown among the heirs, selling a father’s property. That will take a while. Keep pursing the land records made on his property after his death. Examine the probate records for Nathaniel Brown when the microfilm arrives. Review the microfilm for a 1752 probate record naming a Nathaniel Brown in Cambridge which involves guardianship (when it arrives). Perhaps Nathaniel lost his family early, and so didn’t think of naming his children for those relatives. The early Middlesex probate index is here on Ancestry.com, or try this download here on FamilySearch.org. Look over the 1790 federal census for Sudbury and nearby towns, looking at the other Browns. Also seek any Thaddeus in Sudbury in the 1790 census. Keep trying to find any property Nathaniel might have owned in Framingham before his marriage (so far not finding any). Learn more about the Newton couple, Thomas and Abigail Brown. Look for a probate record for Thomas Brown of Newton; it may mention a location for son Nathaniel. If that fails, try to pursue the life of the Nathaniel Brown born to Thomas and Abigail of Newton – see if he can be eliminated. 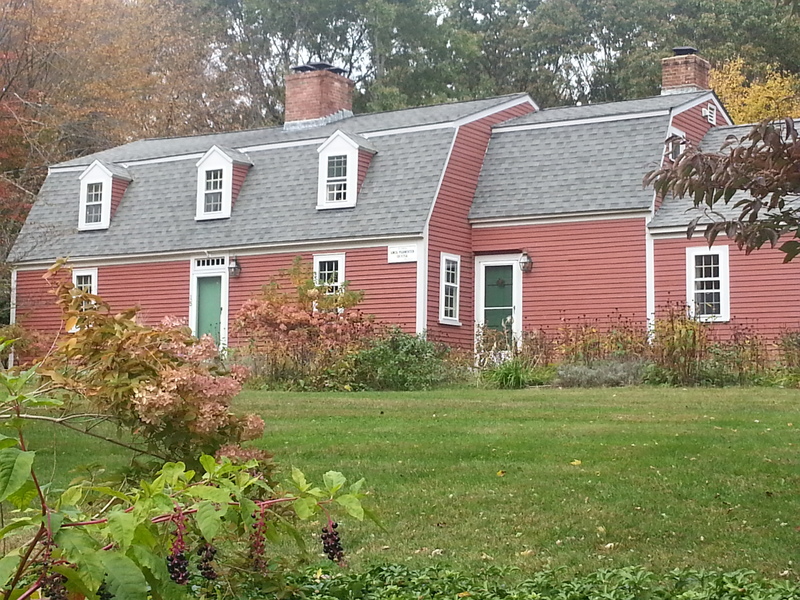 An early Sudbury house built by the Parmenters, in a line more closely related to Midge’s husband than to mine. Photo by Diane Boumenot. After an unusual childhood (Part 1), a determined Sophia Hayden was among the first women admitted to the Architecture Program at MIT in 1886. She was one of two women in the program. An 1888 photograph of all (about 25) MIT female students – each holding an implement appropriate to her studies – shows her looking taciturn and perhaps bored with the picture taking. She was reportedly a quiet, serious and intelligent student. She completed the four year program with honors and graduated in 1890. I made my first visit to an academic archive. The MIT Museum holds some pictures, articles, and the thesis drawing submitted by Sophia. I made an appointment and a kind archivist welcomed me there. The folder of papers that I examined held the suggestion of a letter and biographical sketch from Sophia’s stepdaughter Jennie May, whose married name and 1950’s address were noted, however those documents were not among the holdings. A visit to the School of Architecture and Planning’s Archives brought nothing else of significance although I did have the thrill of meeting an archivist who easily recognized Sophia’s name. In an effort to present all facts, and not ignore those that I can’t fathom, I should add that one 1991 letter in the Museum archive mentioned that Mrs. Elihu Root III (Mary “Molly” Bidwell Root, 1917 – 2004) was the niece of Sophia. Sophia did have three brothers and a sister, however, based on what I can quickly glean of Molly’s parents I see no way that she can be a niece or great-niece. A mystery. The MIT Museum holds Sophia’s thesis project, a large watercolor rendering of a Fine Arts Museum plan in the Beaux-Arts style. The picture, below, does no justice to the project. The original is one of the loveliest things I’ve ever seen. The proportions, the exquisite detail and the subtle colorings show that Sophia was a natural artist. After graduation, Sophia accepted a position teaching mechanical drawing. The reasons for not moving into an architectural firm at an apprentice level are not clear, although doubtless she felt she was unable to obtain that position. Her female classmate did, however, obtain such a position. In 1891 Sophia saw an advertisement for an architectural competition. She entered and won. Next time (Part 3), the story of Sophia’s amazing architectural achievement and the reason why there are no existing buildings designed by her. My gg-grandmother Catherine Spaulding had 4 children. Because I have had very little luck tracing her and her husband(s) further back, I have focused a lot on those four children. They were Aunt Jennie, my g-grandfather Miles Baldwin Sr, Aunt Hattie, and an artist, William Blackstone Bennett. Of the four, my mother probably knew the least about William, so everything I’ve learned is from research. He was the oldest, born to Catherine and a mysterious first husband, William or Thomas Bennett, in western New York around 1853. He was not with his mother and the subsequent husband in the 1860 census so I can only guess he stayed with his father after a divorce. William was a painter (sometimes “portrait painter”; later “decorator”) and traveled extensively as a young man, to various parts of the world. That doesn’t fit well with what I know of Catherine’s life so I can only assume, again, that his father was the catalyst for this style of adventurous living. The first time I find him living with Catherine’s family is in an 1889 city directory in Newton, Mass. He married for the first time, in 1890, a young woman from Digby, Nova Scotia named Harriet Ella Crosby. He and “Ella” became the parents of Jennie May Bennett in 1891. A second daughter born in 1895 lived for about nine months. In 1896, Ella died from consumption. After this tragedy it’s unclear how William got through the next few years but I did see, on a GenealogyBank.com local news article, that Jennie May spent some time with her mother’s sister in Orange, Massachusetts. In 1900, William married again, to Sophia Gregoria Hayden. They were both residents of Winthrop, Mass. (a seaside section of Boston) but were married in Providence with Aunt Jennie’s husband, the judge, presiding. By that time, Catherine and her third husband were also living in Providence and were in attendance. I found the newlyweds, and Jennie May, in the 1900 census in Winthrop, living at 218 Shirley Street, and I was startled to see that the bride had been born in Chile. Sophia Gregoria Hayden was born in 1868 in Santiago, Chile to a Peruvian mother (Elezena Fernandez Hayden) and a father (George Henry Hayden) who was a dentist from an old Massachusetts family. (Coincidentally, my mother is also descended from the Haydens, so there’s a distant connection). She was baptised on 25 Jan 1869 in Santa Ana, Santiago, Chile. When she was old enough to go to school, she was sent to live with her grandparents, George and Sophia Hayden, in Jamaica Plain, Boston, Massachusetts. When eventually her father and siblings moved to the U.S. and took up residence in Richmond, Virginia, she stayed with her grandparents. I suspect that Sophia was remarkable from birth, and that is why she was sent to Boston for her education. She was smart and immensely talented. 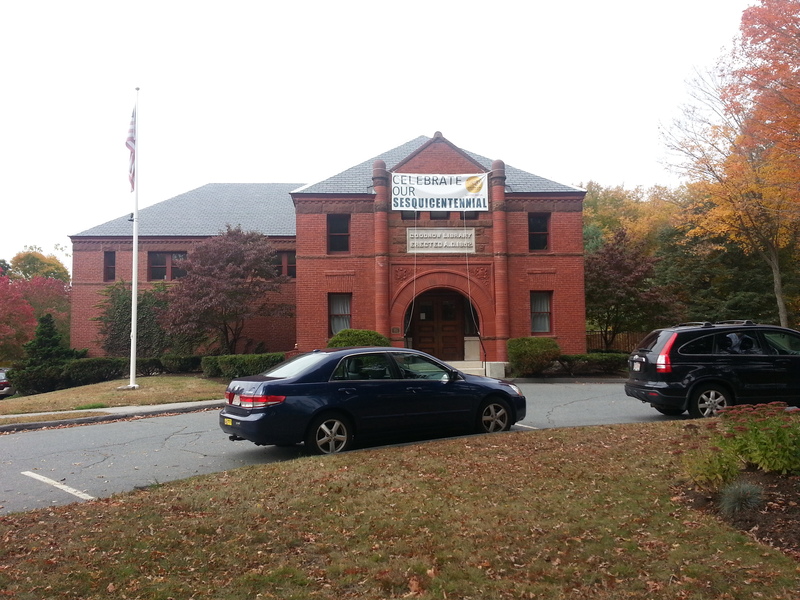 She graduated from Jamaica Plain High School in 1886. Sophia was determined to pursue her dream of becoming an architect. Next time, the story of how she did that (article 2 in this series). This is a series of four articles, so there is also part three about Sophia’s experience at the fair, and part four about her subsequent life.